The land-based construction works of the Contract P560(R) Aviation Fuel Pipeline Diversion Works (Contract P560(R)) commenced on 28 December 2015 on the airport island. The commencement of initial reclamation works was announced on 1 August 2016. This is the 8th Construction Phase Monthly EM&A Report for the Project which summarizes the monitoring results and audit findings of the EM&A programme during the reporting period from 1 August 2016 to 31 August 2016. The key construction activities of the Project carried out in the reporting month were related to Contract P560(R) Aviation Fuel Pipeline Diversion Works (Contract P560(R)) which involved drilling a pilot hole using Horizontal Directional Drilling (HDD), stockpiling of excavated materials from HDD operation and site clearance and preparation works at Sheung Sha Chau. The key activities of the four DCM contracts involved mobilization and off-site plant fabrication, and CLP cable diversion enabling work involved site preparation works. Site investigation works were also continued during the reporting period. The monthly EM&A programme was undertaken in accordance with the Updated EM&A Manual of the Project. During the reporting period, the ET conducted thirty-six sets of air quality measurements, twenty-five sets of construction noise measurements, twelve sets of water quality measurements, one ecological monitoring on Sheung Sha Chau Island, two complete sets of small vessel line-transect surveys and five days of land-based theodolite tracking survey effort for Chinese White Dolphin (CWD) monitoring as well as environmental site inspections, landscape & visual and waste monitoring for the Project’s construction works. On the implementation of the SkyPier Plan, the daily movements of all SkyPier High Speed Ferries (HSFs) in August 2016 were 10 to 94 daily movements, which are within the maximum daily cap of 125 daily movements. A total of 809 HSF movements under SkyPier Plan were recorded. All HSFs had travelled through the SCZ with prevailing speed under 15 knots (5.7 to 14.6 knots) in compliance with the SkyPier Plan. Seven ferry movements had minor deviation from the diverted route. Four of the cases were due to public safety and the remaining three cases are under investigation. In summary, the ET and IEC have audited the HSF movements against the SkyPier Plan and conducted follow up investigation or actions accordingly. On the implementation of the Marine Travel Routes and Management Plan for Construction and Associated Vessel (MTRMP-CAV), skipper training workshops have been held with concerned captains of construction vessels to familiarise them with the requirements of the Plan. The ET is working with contractors to familiarise with the requirements of the MTRMP-CAV . Four DCM contracts were awarded in August 2016. The key activity of the four DCM contracts was mobilization and off-site plant fabrication. Water quality monitoring and CWD monitoirng were conducted as scheduled although no marine construction works was carried during the reporting period. All 1-hour total suspended particulate (TSP), noise and waste were completed in the reporting period for the land-based construction activities. No exceedance of the Action/ Limit Levels was recorded. Monthly ecological monitoring on Sheung Sha Chau Island confirmed that there was no construction works at Sheung Sha Chau and no direct encroachment or disturbance to the identified egretry area. ● Site clearance and construction work at Sheung Sha Chau. ● Site survey and investigation. ● Land-based site preparation works. Site investigation works will continue. The key environmental issues will be associated with dust, noise generation, water quality, construction waste management, CWD, ecological impact on Sheung Sha Chau. The implementation of required mitigation measures by the Contractor will be monitored by the ET. The commencement of initial reclamation works was announced on 1 August 2016. The updated overall phasing programme of all construction works was presented in Appendix A of the Construction Phase Monthly EM&A Report No. 7. Contracts awarded in August 2016 are presented in Appendix A. This is the 8th Construction Phase Monthly EM&A Report for the Project which summarizes the key findings of the EM&A programme during the reporting period from 1 to 31 August 2016. During the reporting period, no construction work was carried out by DCM works contracts and CLP cable diversion enabling works contract. Key construction activities of the Project were related to the Contract P560(R) Aviation Fuel Pipeline Diversion Works (Contract P560(R)) which involved drilling of HDD pilot hole at the HDD launching site located at the west part of the airport and site clearance and preparation works at Sheung Sha Chau. The excavated materials from HDD operation were stockpiled at the stockpile area located near Chun Ming Road adjacent to Tradeport Logistic Centre on the airport island. 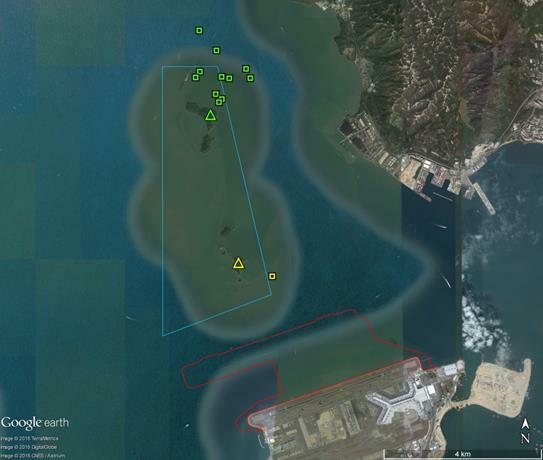 The HDD launching site and stockpiling area are around 3 km and 900m away respectively from the nearest air and noise sensitive receivers in Tung Chung and the villages in North Lantau. The locations of the works areas are presented in Figure 1.1 to Figure 1.2. Some site investigation works were carried out during the reporting period. The general water quality monitoring commenced on 4 August 2016 as scheduled, although there were no marine construction works. The early regular DCM water quality monitoring commenced on 4 August 2016 as scheduled, although there were no marine construction works. The Coral Translocation Plan was approved by EPD on 6 June 2016 under EP Condition 2.12. Baseline CWD results were reported in the CWD Baseline Monitoring Report as submitted to EPD on 15 July 2016 in accordance with EP Condition 3.4. The CWD Baseline Monitoring Report was approved by EPD on 25 July 2016. Monitoring of CWDs commenced in August 2016 as schedueled , although there were no marine construction works. Taking into account the construction works in this reporting month, impact monitoring of air quality, noise, waste management, ecology and landscape & visual were carried out in the reporting month. No marine construction works was conducted during the reporting period. Water quality monitoring and CWD monitoring were conducted as scheduled although there were no marine construction works during the reporting period. The EM&A programme also involved weekly site inspections and related auditings conducted by the ET for checking the implementation of the required environmental mitigation measures recommended in the approved EIA Report. The scheduled impact 1-hour TSP monitoring at AR1A on 2 August 2016 was cancelled due to adverse weather. The monitoring at AR1A on 2 August 2016 was rescheduled to 3 August 2016. The air quality monitoring schedule involved in the reporting period is provided in Appendix D.
The portable direct reading dust meter is calibrated every year against high volume sampler (HVS) to check the validity and accuracy of the results measured by direct reading method. The calibration certificates of the portable direct reading dust meter are provided in Appendix C. The corresponding calibration record of the HVS is also given in Appendix C.
Calibration certificates of the sound level meters and acoustic calibrators used in the noise monitoring are provided in Appendix C.
The scheduled water quality monitoring on 2 August 2016 during ebb and flood tides and 18 August 2016 during ebb tide were cancelled due to adverse weather. The water quality monitoring schedule for the reporting period is provided in Appendix D.
^1 As per findings of Baseline Water Quality Report, the control reference will be changed from C3 to SR2 from 1 Sep 2016 onwards. The water samples for all monitoring parameters were collected, stored, preserved and analysis according to the Standard Methods, APHA 22nd ed. and/or other methods as agreed by the EPD. In-situ measurements at monitoring locations including temperature, pH, DO, turbidity, salinity and water depth were collected by equipment listed in the following. Water samples for heavy metals and SS analysis were stored in high density polythene bottles with no preservative added, packed in ice (cooled to 4 ºC without being frozen), delivered to the laboratory within 24 hours of collection. Calibration certificates of the monitoring equipment used in the monitoring are provided in Appendix D.
Analysis of SS and heavy metals have been carried out by a HOKLAS accredited laboratory, ALS Technichem (HK) Pty Ltd (Reg. No. HOKLAS 066). Sufficient water samples were collected at all the monitoring stations for carrying out the laboratory SS and heavy metals determination. The SS and heavy metals determination works were started within 24 hours after collection of the water samples. The analysis of SS and heavy metals have followed the standard methods summarised in Table 4.5. The QA/QC procedures for laboratory measurement/ analysis of SS and heavy metals were followed and presented in Appendix F.
The commencement of initial reclamation works was announced on 1 August 2016. Four DCM contracts were awarded in August 2016. The key activity of the four marine DCM contracts was only mobilization and off-site plant fabrication. No marine construction works was conducted during the reporting period. The general water quality monitoring was completed as scheduled and the results showed that some parameter such as DO was appeared to reflect the seasonal low of surrounding water body according to EPD’s long-term marine water quality monitoring data. As the water quality monitoring results were collected before the commencement of marine construction works, the measurement data collected in August 2016 may take into account for reviewing the baseline water quality condition. Water quality monitoring results and graphical presentations are provided in Appendix E.
No construction work for four DCM contracts and CLP cable diversion enabling works was undertaken and hence no waste was generated during the reporting period. Weekly monitoring of Contract P560(R) Aviation Fuel Pipeline Diversion Works was carried out by the ET on 3, 10, 17, 24 and 31 August 2016 to check and monitor the implementation of proper waste management practices during the construction phase. For Contract P560(R) Aviation Fuel Pipeline Diversion Works, recommendations were provided during monitoring including provision of drip tray for the oil drums on 24 August 2016, removal of oil stain on ground as chemical waste on 17, 24 and 31 August 2016. The contractor had followed up with implementation of mitigation measures. Based on the updated information, about 210 m3 excavated materials were produced from the HDD launching site in August 2016. The generated excavated materials were temporarily stored at storage and stockpiling area at Chun Ming Road adjacent to Tradeport Logistic Centre on the airport island. The excavated material will be reused in the Project. In addition, metals, paper and plastic were recycled during the reporting month. 3.9 tonnes of general refuse were disposed of to the West New Territories (WENT) Landfill and 0.16 tonnes of chemical waste was disposed of to the Tsing Yi Chemical Waste Treatment Centre in August 2016. No Construction and Demolition (C&D) material was disposed off-site during the reporting month. The small vessel line-transect survey as proposed in the Updated EM&A Manual should be conducted at a frequency of two full survey per month while land-based theodolite tracking should be conducted at a frequency of one day per month per station during the construction phase. In addition to the land-based theodolite tracking required for impact monitoring as stipulated in the EM&A Manual, some supplemental theodolite tracking have also been taken during the initial implementation period for the SkyPier HSF diversion and speed control in order to assist in monitoring the effectiveness of these measures, i.e. in total twice per month at the Sha Chau station and three times per month at the Lung Kwu Chau station. Within the monitoring month of August 2016, two complete sets of small vessel line-transect surveys were conducted on the 5th , 9th 10th, 15th, 19th, 22nd, 24th and 25th August 2016, covering all transects in NEL, NWL, AW, WL and SWL survey area for twice. A total of 469.08 km of survey effort was collected from these surveys, with 91.8% of the total survey effort being conducted under favourable weather condition (i.e. Beaufort Sea State 3 or below with favourable visibility). Details of the survey effort may refer to Appendix E.
In August 2016, 19 groups of CWD with 69 individuals were sighted. Amongst the sightings of CWD, 15 groups with 61 individuals were made during on-effort search under favourable weather condition (i.e. Beaufort Sea State 3 or below with favourable visibility). For details of cetacean sightings refer to Appendix E.
Distribution of CWD sightings recorded in August 2016 is illustrated in Figure 6.3. The sightings were mainly located east of Lung Kwu Chau and in Urmston Road near Castle Peak Power Station in the NWL survey area, and Tai O, Yi O and Peaked Hill in the WL survey area. No sightings of CWDs were recorded within or in close proximity to the 3RS land-formation footprint. The STG and ANI of CWD in the whole survey area (i.e. NEL, NWL, AW, WL and SWL) of August 2016 and the running quarterly STG and ANI calculated from the three preceding survey months are presented in Table 6.4 below. *Running quarterly encounter rates STG & ANI for reporting were calculated from the three preceding survey months, i.e. the data from 18 May to 17 June 2016, the data in July 2016 and August 2016, containing six sets of transect surveys for all monitoring areas. In August 2016, the average group size of CWDs was 4.1 individuals per group. The majority of the CWD groups were medium in size with 3-9 individuals. Five groups out of 15 were small in size with 1-2 individuals. No large CWD groups with 10 or more individuals were sighted in August 2016. No CWDs were sighted with association with operating fishing boats in August 2016. Three pairs of mother-and-calf and mother-and-spotted juvenile (SJ) pairs were sighted. Two pairs were sighted in the WL survey area while the remaining pair was sighted in the NWL survey area. In August 2016, a total number of 22 different CWD individuals were identified. Amongst these 22 identified individuals, seven (NLMM028, NLMM035, NLMM036, NLMM037, NLMM038, SLMM011 and SLMM015) were sighted for twice and one (NLMM002) was sighted three times in August. A summary of photo identification works is presented in Table 6.5. Representative photos of these individuals may refer to Appendix E.
Land-based theodolite tracking surveys at Lung Kwu Chau were conducted on 5th, 11th and 23rd August 2016 and at Sha Chau on 1st and 9th August 2016. A total of 5 days of land-based theodolite tracking survey effort have been accomplished in August 2016. A total number of 12 CWD groups were tracked during the surveys. Information of survey effort and CWD groups sighted during these land-based theodolite tracking surveys are presented in Table 6.6. Details of the survey effort and CWD groups tracked are presented in Appendix E. The first sighting locations of CWD groups tracked during land-based theodolite tracking surveys in August 2016 were depicted in Figure 6.4. Underwater acoustic monitoring using Passive Acoustic Monitoring (PAM) should also be undertaken within the whole duration for land formation related construction works. An Ecological Acoustic Recorder (EAR) has been deployed and positioned at south of Sha Chau Island with 20% duty cycle (Figure 6.5). The PAM deployment is generally last for4-6 weeks prior to data retrieval as one batch of data for analysis. Acoustic data will be gathered to listen for CWDs occurrence patterns and to obtain anthropogenic noise information simultaneously. Analysis (by a specialized team of acousticians) involved manually browsing through every acoustic recording and logging the occurrence of dolphin signals. All data will be re-played by computer and listened to by human ears for accurate assessment of dolphin group presence. As the period of data collection and analysis takes more than two months, PAM results could not be reported in monthly intervals. The EAR was deployed on 15 August 2016 in this reporting period and scheduled to be retrieved on 12 September 2016. Data transfer and analysis of this batch of PAM data are tentatively scheduled for completion by end of November 2016. There were no marine construction activities underway in the reporting month. Contract-specific Marine Mammal Watching Plan and Dolphin Exclusion Zone Plan were still under preparation by contractors in this time-period, therefore audits of acoustic decoupling and dolphin exclusion zone implementation were not applicable during this reporting period. For indication, detailed analysis of CWD monitoring results collected by small vessel line-transect survey (such as distribution of group size, activities/boat association, mother-calf pairs and re-sightings) will be provided in future quarterly reports. Detailed analysis of CWD monitoring results collected by land-based theodolite tracking (such as time of day or year, group size, behavioural state and vessel activity) and PAM will be provided in future yearly reports when a larger sample size of data be collected for supplementing the findings from vessel based monitoring. No marine construction works was conducted during the reporting period. CWD monitoring was conducted as scheduled although no marine construction works was carried out during the reporting period. The baseline conditions for the CWD will be reviewed and the Event and Action Plan will be further reviewed when 12-month CWD data be collected. No construction work for four DCM contracts and CLP cable diversion enabling works was undertaken during the reporting period, thus no weekly site inspection for those contracts was conducted during the reporting period. Weekly site inspection of the construction works for P560(R) was carried out by the ET on 3, 10, 17, 24 and 31 August 2016 to monitor the implementation of proper environmental pollution control and mitigation measures for the Project. Site inspections were also conducted independently by the Project’s Independent Environmental Checker (IEC) on 5 and 17 August 2016. Observations have been recorded in the site inspection checklists and passed to the Contractor together with the appropriate recommended mitigation measures where necessary. The key observations from site inspection and associated recommendations were related to the improvement of efficiency of sedimentation tank, provision of drip tray for chemical containers, proper maintenance of drip tray, and removal of oil stains on ground as chemical waste. Key audit findings for the SkyPier HSFs travelling to/from Zhuhai and Macau against the requirements of the SkyPier Plan during the reporting period are summarized in Table 7.1. The daily movements of all SkyPier HSFs in August 2016 were within the maximum daily cap number (i.e. 10 to 94 daily movements, which are within maximum daily cap of 125 daily movements). There are fewer ferry movements on 1st and 2nd August 2016 (52 and 10 movements respectively ) due to Typhoon. Status of compliance with annual daily average of 99 movements will be further reviewed in the annual EM&A Report. In total, 809 ferry movements between HKIA SkyPier and Zhuhai / Macau were recorded in August 2016 and the data are presented in Appendix I. The time spent for the SkyPier HSFs travelled through the SCZ in August were presented in Figure 7‑1. It will take 9.6 minutes to travel through the SCZ when the SkyPier HSFs adopt the maximum allowed speed of 15-knot within the SCZ. Figure 7‑1 shows that all the SkyPier HSFs spent more than 9.6 minutes to travel through the SCZ. ● Cases on 3 and 15 August 2016: HSF captains reported that they had to give way to other vessels for safety reason and were not able to enter the SCZ through the gate access points. Then the HSF returned to the normal route following the SkyPier Plan. ● Case on 4 and 18 August 2016: HSF captains reported that the deviation was due to strong tidal wave and current. ● Case on 14, 26 and 28 August 2016: These cases are under investigation. Cases of minor route deviation in July 2016 have been followed up. For the cases on 1, 8, 9, 11, 12 and 15 July 2016, similar minor deviations of diverted route were observed. The six cases were recorded with the same ferry. Repeated deviations were recorded with the same captain for the five cases on 8, 9, 11, 12 and 15 July 2016 and another captain is responsible for the remaining case on 1 July 2016. The ferry operator reported that the deviations were due to strong tidal wave and current and wrong reference points of SCZ were applied. The instantaneous speeds of all the above cases were within the 15-knot speed limit. Warning letter has been issued to the concerned ferry operator to prevent reoccurrence. The ferry operator is also recommended to check the coordinates of SCZ plotted on the radar. Refresher training to the two concerned vessel captains will be provided by experienced captain of the concerned ferry operator to ensure the captains are familiarised with the SkyPier Plan requirements. For the case on 22 July 2016, investigation found that the vessel captain was required to give way to other vessels for safety reason. After that, the HSF returned to the normal route following the SkyPier Plan. All HSFs were within 15 knots (5.7 knots to 14.6 knots), which complied with the SkyPier Plan. The time used by HSF to travel through SCZ is presented in Figure 7‑1. 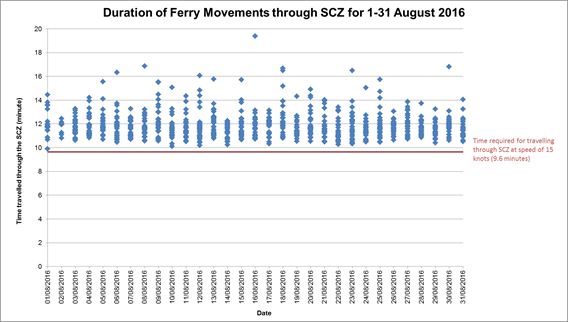 10 to 94 daily movements (within maximum daily cap - 125 daily movements) There are fewer ferry movements on 1st and 2nd August 2016 (52 and 10 movements respectively ) due to Typhoon. Although no major construction activities were conducted in August 2016, skipper training workshops have been held with concerned captains of construction vessels associated with Contract P560(R) Aviation Fuel Pipeline Diversion Works and the four DCM contracts to familiarise them with the predefined routes, general education on local cetaceans, guidelines for avoiding adverse water quality impact, the required environmental practices / measures while operating construction and associated vessels under the Project, and guidelines for operating vessels safely in the presence of CWDs. The ET will work with new Contractors mobilising for 3RS works on reviewing and helping them familiarise with the requirements of the MTRMP-CAV. ET has audited of all the relevant information, including AIS data, vessel tracks, record of potential deviations and the responses provided by concerned captain, to ensure full compliance with the requirements of the MTRMP-CAV. Weekly audits have been conducted in August to ensure that sufficient information has been provided by Marine Traffic Control Center (MTCC). The IEC of the Project has also performed audit on the compliance of the requirements as part of the EM&A programme. In accordance with the Updated EM&A Manual, ecological monitoring shall be undertaken monthly at the HDD daylighting location on Sheung Sha Chau Island to identify and evaluate any impacts with appropriate actions taken as required to address and minimise any adverse impact found. Monthly ecological monitoring on Sheung Sha Chau Island observed one suspected late breeding/nursery activitiy of egret at the southern side of the island and confirmed that there was no construction works at Sheung Sha Chau and thus no direct encroachment or disturbance to the identified egretry area. During the reporting period, environmental related licenses and permits required for the construction activities were checked. No non-compliance with environmental statutory requirements was recorded. The environmental licenses and permits which are valid in the reporting month are presented in Appendix G.
Site investigation works will continue to carry out to support design process. 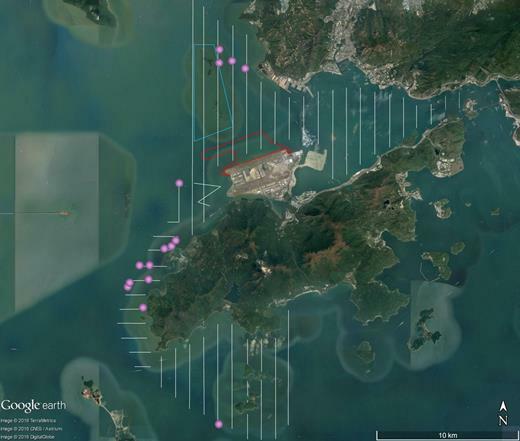 The key construction activities of the Project carried out in the reporting month were related to Contract P560(R) which involved drilling of HDD pilot hole, stockpiling of excavated materials from HDD operation and site clearance and preparation works at Sheung Sha Chau. Works under the other four DCM contracts involved mobilization and off-site plant fabrication, and CLP cable diversion enabling work involved site preparation works. Some site investigation works were also carried out during the reporting period. As observed on site and confirmed by the contractor, no marine construction works was conducted during the reporting period. The water quality monitoring and CWD monitoring were completed as scheduled although no marine construction works was carried out during the reporting period. No breach of the Action or Limit Levels in relation to the air quality, construction noise, waste and ecological monitoring were recorded in the reporting month. All site observations made by the ET were recorded in the site inspection checklists and passed to the Contractor together with the recommended follow-up actions. On the implementation of the SkyPier Plan, the daily movements of all SkyPier HSFs in August 2016 were 10 to 94 daily movements, which are within the maximum daily cap of 125 daily movements. A total of 809 HSF movements under SkyPier Plan were recorded in August 2016. All HSFs had travelled through the SCZ with prevailing speed under 15 knots (5.7 to 14.6 knots) in compliance with the SkyPier Plan. Seven ferry movements showed minor deviations from the diverted route. Four of the cases were due to public safety and the remaining three cases are under investigation. In summary, the ET and IEC have audited the HSF movements against the SkyPier Plan and conducted follow up investigation or actions accordingly.